What Ever Happened to Nuclear Winter? In terms of environmental damage, nothing could be worse than nuclear war. Even an exchange of a few hundred ICBMs on each side would end human life on the planet, along with most plants and animals. In 1982, concern focused on the dangers of Nuclear Winter. The concept was set forth in the TTAPS report, named for its five authors: Richard Turco, Owen Toon, Thomas Ackerman, James Pollack and Carl Sagan. Fire storms caused by an exchange of bombs would send enough smoke and soot into the atmosphere to block sunlight for a period of three months to several years. Initially it would blanket the Northern Hemisphere, but would then spread to the Southern Hemisphere so nowhere would be safe. The haze would make photosynthesis impossible, like a winter day. First plants would die, next the herbivores would starve, and then the carnivores would starve. Nearly all humans would die within months. Whether any humans would survive at all is doubtful. According to Carl Sagan, as few as two hundred bombs on each side would be enough to cause a Nuclear Winter. This TTAPS research was an early use of the climate models, now better known for their analysis of global warming. During the next few years, other scientists confirmed its conclusions. Yet, there has been no additional research. There wasn’t any more to say. 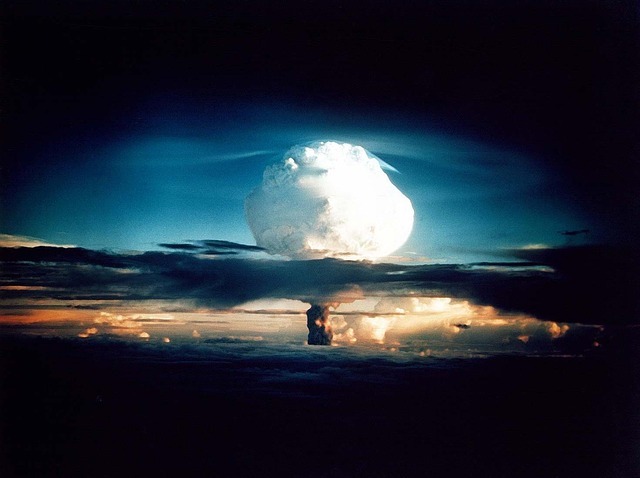 At the time, the USSR had 34,000 nuclear weapons and the United States had 23,000. After the TTAPS report, the alarm disappeared, but not because the threat disappeared. Since the collapse of the Soviet Union, ICBMs are no longer aimed at specific targets and the number has been reduced. Today, the United States and Russia each have more than 7,000 each, with about 1,800 deployed on each side. Although the end of the Cold War has greatly reduced the risk, the two former rivals have huge stockpiles. A nuclear exchange, even a partial one, would cause Nuclear Winter. Two other Cold War allies of the U.S. have smaller stockpiles. France has 300 weapons and Britain has 215. Like the U.S., these allies are prudent and have many safeguards against accidents. Four other nuclear countries bear watching. China has 260 warheads and India and Pakistan have about 120 each. Israel, while not acknowledging a weapons program, is thought to have 80-200. War in the Middle East could trigger disaster. Today the greatest danger of nuclear war comes from small states like Iran and North Korea. Supposedly, the agreement of July 2015 between Iran and the 5+1 group (the U.N. Security Council plus the European Union) has put off that danger for the immediate future. North Korea exploded an atomic bomb in 2009 and may have up to 30 in its arsenal. Incredibly, on Dec. 10, it announced it had a hydrogen bomb. It was an assertion virtually no one believed, but was a sign of its recklessness. (A hydrogen bomb has a hundred times the power of an atomic bomb.) Most experts believe that in building its first atomic bomb, North Korea received help from Pakistan. Using a macabre calculus for nuclear war scenarios in the Middle East or East Asia may give a total weapons exploded count below the TTAPS threshold of 400. This would mean millions killed, but not quite the onset of full Nuclear Winter. However, the calculus might also be higher, setting off the ultimate destruction of plants, animals and humans. The most perplexing question about Nuclear Winter, however, is why no one discusses the danger anymore.